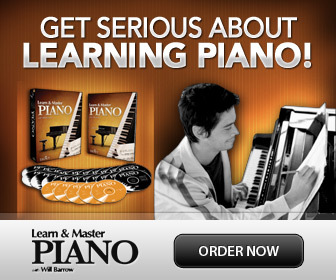 Learning how to play piano and read music at the same time can be frustrating both for beginners and more advanced players. Here are 6 simple steps anyone can do and practice that take very little time to learn. Become a better note reader today! Keep Your Eyes on the Music! In my piano studio I usually see that my students fall in either group; the student who easily reads and plays, but has some trouble memorizing, and the student who has a really hard time keeping the eyes on the notes, but on the other hand easily memorizes. Imagine you are driving a car- keep your eyes looking ahead, that is; reading the score! Keep in mind that balance is good: you need to be both a good note reader and take the time to memorize and learn to play things by ear. I have written a review about a useful piano software that is great at teaching you how to play piano and read music at the same time. Read the review here. The main key to easy note reading while playing, is NOT to look at your hands. Below are 6 effective exercises to learn how to read while playing, and how to be able to keep your eyes in the music! Here are the 6 steps you need to take the time to learn and do, and you'll become much better at being able to play piano and read music at the same time! Pick music with large enough fonts, and make sure you can see the notes clearly. Use eye glasses if you need them and check your lighting. Also make sure to sit at the right distance so you have no trouble seeing the whole music score. Select practice pieces much easier than what you are currently working on. This makes it easier to focus on the written notation, and you will get less tempted to look down on your hands. Play "around" on the keys with your eyes closed, and learn to find your way without looking at your hands. Practice to feel each finger on different keys while you identify each finger number and the key you play. You can also try a blindfold! You will soon discover that it's much easier than you thought to play without being able to see either your hands or the piano keyboard. Find the position for your hands, and then play your easy piece slow enough for you being able to keep your eyes in the score at all times. The only exception may be for big jumps, where you can briefly look down at the keyboard too see where you're "going" and then return to read the score. For really hard cases of eyes darting to the hands and keyboard all the time when reading; I hold a piano book or something above my students hands ("the magic carpet"). You could try placing a folded cardboard or something to make it really hard to see your hands. This will not be needed for long, since you will soon notice how EASY it is to keep your eyes on the notes and to play without looking at your hands! You may practice like this a little bit each day, but soon you will see that you actually can play piano and read music without any problems, anytime you like. Just remember- it is also important to play by heart, without any notes, and actually look at your hands and piano keys as you play. So, make sure to keep the balance! Learning to Read Music: How to make sense of those mysterious symbols and bring music alive.